A newspaper article about Marie Jones Francis, the "midwife of Sanford." Francis left behind a successful hotel and restaurant she owned in Sarasota in 1942 to return to Sanford and become a midwife. World War II caused a shortage in doctors and nurses, so Florida's Children's Bureau sent Francis to Florida A & M to acquire her practical nursing license in 1945. She specialized in premature babies and returned to Sanford to aid her mother, Carrie Jones, at Fernald-Laughton Memorial Hospital before they opened the ward in their home. "When her health starting failing," she recollects in a newspaper article, "I took over." Francis converted her house at 621 East Sixth Street to also serve as a maternity ward, where she delivered over 40,000 babies over her 32 year career. She became a midwife in the same vein as her mother, Carrie Jones, and together they ran the Jones-Francis Maternity Hall in Georgetown. Original newspaper article: Jerla, Michelle. "Sanford's Birth Place: Marie Jones Francis Delivered More than 40,000 Babies in Her Sixth Street Home." The Seminole Herald, February 16, 2003: Private Collection of Daphne F. Humphrey. 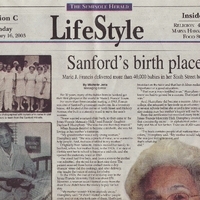 Digital reproduction of original newspaper article by Michelle Jerla: "Sanford's Birth Place: Marie Jones Francis Delivered More than 40,000 Babies in Her Sixth Street Home." The Seminole Herald, February 16, 2003. The Seminole Herald, February 16, 2003, page 1C. Originally created by Michelle Jerla published by The Seminole Herald. Copyright to the resource is held by The Seminole Herald and is provided here by RICHES of Central Florida for educational purposes only. For 30 years, many of the babies born in Sanford got their first glimpse of the world in Marie J. Francis' house. For more htan three decades starting in 1943, Francis was one of Sanford's prominent midwives. In a two-story house, still located at the corner of Sixth Street and Hickory Avenue, she built a maternity ward to serve the area's women. "Some wanted a natural child birth, so they came to the Jones/Francis Maternity Hall," said Francis' daughter Daphne F. Humphrey. "She was the one that they trusted." When Francis decided to become a midwife, she was following in her mother's footsteps. "My grandmother was a very strong woman," Humphrey said. "She was a practical nurse, who wanted to help people. And that was installed in my mother." Orginally from Sarasota, Francis moved her family to Sanford, where her mother lived, in the 1940s. The state of Florida sent her to school to become a midwife, and she opened the maternity ward in 1943. Jerla, Michelle. “Sanford's Birth Place: Marie Jones Francis Delivered More than 40,000 Babies in Her Sixth Street Home.” RICHES of Central Florida accessed April 20, 2019, https://richesmi.cah.ucf.edu/omeka/items/show/2933.